Open 9:30 a.m. - 4:00 p.m.
Open 9:30 a.m. - 6:00 p.m. The zoo is open daily except Christmas Day, December 25. Save 46% or more at Seattle’s 5 best attractions: Space Needle, Seattle Aquarium, Argosy Cruises Harbor Tour, Pacific Science Center OR Chihuly Garden & Glass, and Woodland Park Zoo. Valid 9-days. Get your CityPASS now or purchase at zoo gates. 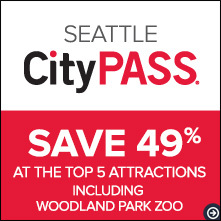 Con los tickets Seattle CityPASS ahorrarás un 46 % o más en la entrada al Woodland Park Zoo y a otras 4 atracciones principales de Seattle. Para obtener información y para compra boletos traducidos al Español, visite el sitio web traducido, es.citypass.com. The gorilla exhibit will be closed from April 23, 2019 to late May/early June to install improvements in the exhibit. The entrances to the gorilla exhibit, located at Colobus monkey and Jaguars, will be closed during this time. Molbak's Butterfly Garden opens May 24, 2019. The Day Exhibit is closed until further notice. Phinney Ave. N. between N. 55th and N. 56th St.
N. 50th St. and Fremont Ave. N.
From North or South bound I-5, take Exit 169/NE 50th St, go west 1.3 miles to arrive at the South Entrance. Take North or South bound Metro Bus #5 to Phinney Ave. N. and N. 55th St. to arrive at the West Entrance. Ride your bike to the zoo and save $2 off regular zoo admission! Present your bike helmet, optionally with a Bike Benefits sticker, as proof of ridership at the entrance locations to redeem your discount. ADA accessible parking stalls are available in all zoo lots. Parking fees do not apply for any vehicle displaying a valid disabled parking placard, in any WPZ parking space. There are four Eluminocity chargers in the Otter Lot by the West Entrance, and two Eluminocity chargers in the Hippo Lot by the South Entrance. Pay-for-parking kiosks are located at each lot. No overnight parking is permitted in the zoo lots. RV and bus parking is available at the South Entrance Hippo Lot, N. 50th St. & Fremont Ave. N.
Additional parking is located in Lower Woodland Park at N. 50th and Aurora Ave. N. about .1 mile from the South Entrance. For questions about daily admission and online purchasing, please refer to our FAQ.